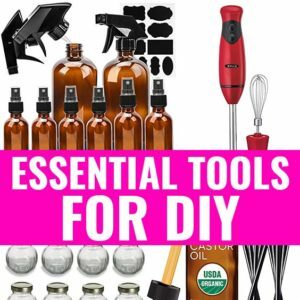 Rosehip and Carrot Seed Facial Serum - beautymunsta - free natural beauty hacks and more! 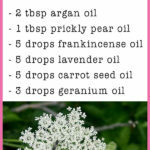 One of the most popular DIY anti-aging skin care products you can make at home is this rosehip and carrot seed oil facial serum! Let’s begin by exploring the benefits of rosehip oil and carrot seed oil for your skin! 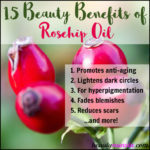 Rosehip oil is highly touted in the skin care world! And this is with good reason too! 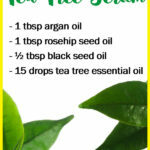 The luxurious oil is excellent for aging skin and getting rid of scars. It is obtained from rosehips, which are the fruit of the wild rose plant (scientific name: Rosa canina, Rosa moschata or Rosa rubiginosa). So it is not got from the regular rose plant we know! 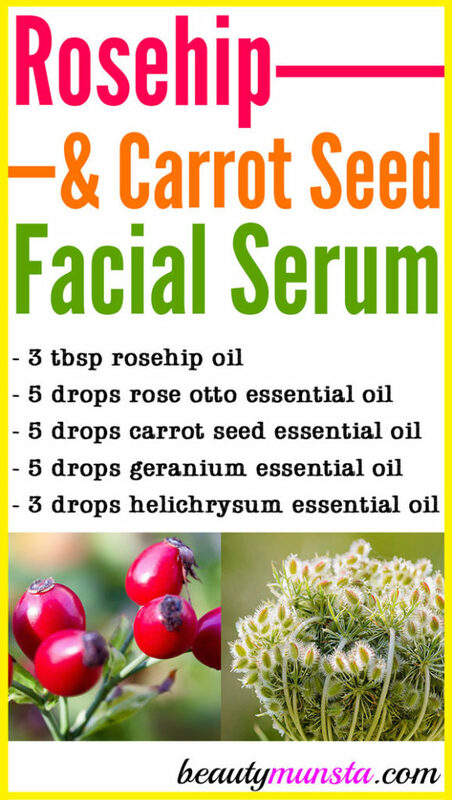 Okay, now that we’ve seen the benefits of rosehip oil and carrot seed essential oil, let’s jump onto our awesome rosehip and carrot seed facial serum! Get a 2 oz amber glass dropper bottle. Now pour in 3 tbsp of rosehip seed oil into it with the help of a small funnel to avoid spillage. Carefully add 3 drops each of rose otto, carrot seed, geranium and helichrysum essential oils. Cap the bottle tightly and roll it between your palms to gently combine everything. Do not shake the bottle as this will create air bubbles that can make your serum go rancid faster! 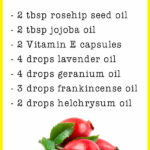 Remember we’re working with rosehip oil which has a shelf life of only 6 months. Your rosehip and carrot seed facial serum is ready! Store it in a cool dry place. To use, place 3-4 drops on your palm, rub both palms together and massage them onto your clean face and neck, avoiding your eyes and lips. Use twice a day after cleansing your face! 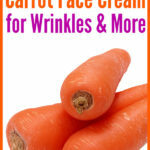 Give this awesome rosehip and carrot seed facial serum a go!